The Western New York Flash announced today that the club has exercised its option on midfielder Lady Andrade, meaning the Colombian star will return for the 2016 season. "Lady's return is huge for the club," said Rich Randall, General Manager of the Flash. "She will be a key part of an extremely dynamic midfield this season. Her brand of soccer is difficult to defend and also exciting to watch as a fan." Andrade joined the Flash in July of 2015 after leading Colombia to the Round of 16 in the 2015 FIFA Women’s World Cup. 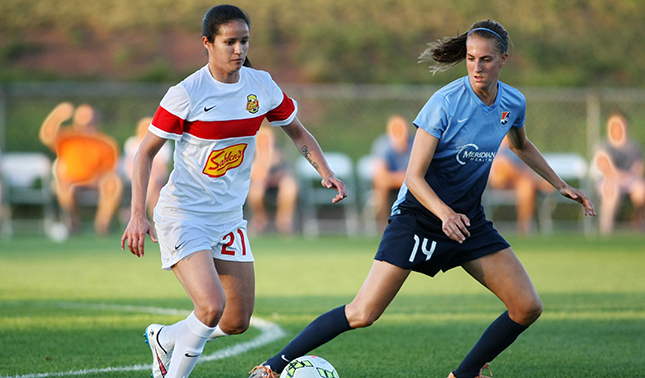 The midfielder, 24, appeared in six matches for the Flash and scored her first NWSL goal on August 1 at Sky Blue FC. On the international stage, Andrade has 45 caps with the Colombia Women’s National Team, holding nine goals to her name. In December, the Bogotá native led Colombia’s futsal team to the Copa America championship, defeating Uruguay 4-2. Andrade was named the tournament’s Most Valuable Player after leading her team to the title. 2016 Flash season tickets are currently on sale and can be purchased for as low as $100 at wnyflash.com or by calling (716) 655-PLAY.